Love to go out to eat like I do? Live in North Jersey, well Jersey in general? 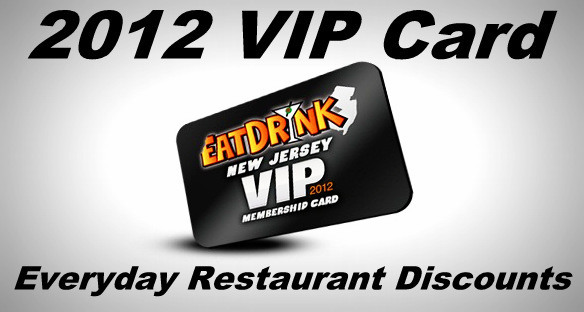 Then the Eat Drink New Jersey website & VIP card program is perfect for you! Eat Drink New Jersey is a statewide website that has deals for people throughout the state of NJ. It originally started with Eat Drink Hoboken (where it was founded) then after three years and more inquiries they added Montclair, Jersey City, and Morristown. Within the past year the site has drawn so much buzz because of the deals and information it provides. I personally went to Eat Drink Morristown constantly while I was in college to find Happy Hour deals and more. Now the big deal they have is their VIP card. It’s only $20 but worth every dollar, because you get so much savings! Plus, they are currently offering a buy one, get one free deal at the moment! Here’s why the VIP card is so great, when you bring it to any of the 50+ restaurants listed here, you get 10% off everyday and some restaurants who choose to have an extra 20-50% off on certain days. For example, you get an extra 20% off at Liberty Bar in Hoboken on Mondays! I used my card with my dad at George and Martha’s in Morristown once and it was great to have. I know I’ll definitely be using it more when I head to Hoboken, too! I highly recommend you get a VIP card and start saving! Last, since this only benefits my North Jersey followers at the moment…I have good news– they plan on expanding to Atlantic City as well as the Jersey Shore and possibly the US! Of course, like all great things this will take time! But til then I will be using my card around North Jersey and there is plenty of time & restaurants to do that! One last bit of good news– they are partnering up with Stear Clear which is a Designated Driver service. Bars with deals & a designated driver service? I don’t know what can be better?! I can’t wait to head to The Office or Blue Moon again soon and get my 10% off! Let me know if you agree me and if you’ve checked out Eat Drink New Jersey! You can follow them on Twitter @EatDrinkNJ and find them on Facebook too! This entry was posted in deals, food and tagged bar, blogs, deals, EatDrinkNJ, food, foodies, restaurants, scbd by smallchickbigdeals. Bookmark the permalink.